The Joliet Junior College Society of Physics Students and STEM Scholars hosted their second open to the public event of the two part series to lecture about the field of quorum sensing in D-2001. This free event took place at the main campus on Nov. 6 for an hour and a half, starting at 4 p.m. and ending at 5:30 p.m. and a half hour at the end in case people had any questions. The guest speaker at the event was Dr. Tiara Perez Morales, a microbiologist from Benedictine University, who visited to discuss how bacteria can coordinate activity and synchronize their response to external signals. She was in for a warm welcoming by the amount of the participants alone with major being science and medical majors. Without a doubt, a sense of anticipation filled the room which was so crowded that people were willing to sit across the floor just to attend. It was an amazing sight to see as you walked in, but you can tell they were not expecting that big of a turnout. This was probably due to that it was also the last day to vote for the Illinois midterm election. JJC’s students proved that science is of importance and that they value their education. This gave the guest speaker the confidence to crack a few jokes and get the students involved. This camera friendly event had many people taking pictures and you could tell the students were instantly engaged by how many people had a writing utensil and note pad moving. 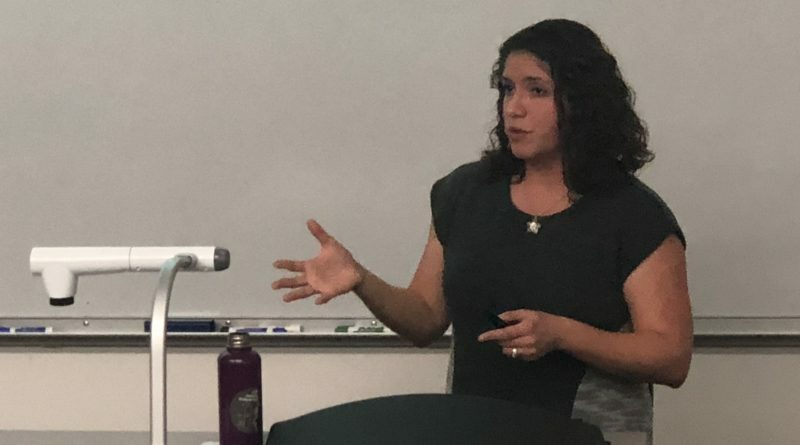 Morales asked the audience multiple questions, and was amazed by the audience participation and the prior knowledge most students and faculty had on the topic. Professor Morrison did not hesitate to properly inform the participants what the lecture entailed and what to look forward to, so that they could be prepared to ask many questions. It was quite obvious that it worked, because many student replied that they did their research prior to the lecture and was prepared to ask many questions. The PowerPoint presentation was smoothly put together and if you were lucky enough to sit near the front, there was a high possibility that you were provided a paper copy as well. In case you have never heard of quorum sensing, here is some background knowledge. According to “Protein Science,” quorum sensing is used by a large variety of bacteria to regulate gene expression in a cell-density-dependent manner. Bacteria can synchronize population behavior using small molecules called autoinducers that are produced by cognate synthases and recognized by specific receptors. Quorum sensing plays critical roles in regulating diverse cellular functions in bacteria, including bioluminescence, virulence gene expression, biofilm formation, and antibiotic resistance. Morrison also gave a brief speech at the first event as well, leading to an introduction of the guest speakers. This gave the students time to get situated by finding their seats and enjoying the complimentary snacks the event provided. The audience was informed that Morales taught many lab courses on Microbial Genetics and Principles of Infectious Diseases. She realized half way through college that she had a knack for teaching, and that see was really good at it. This could explain why she brought with her two of her students who recommended taking her courses if anyone was interested in the field. The two students of hers spoke briefly on some of their summer research, but they did not want to steal the show so they let their research in Morales’ presentation do most of the talking. The presentation went on and people crowded the guest speaker with questions and snapped a picture of the paper copy if they did not receive one. Without the doubt the Society of Physic Students and S.T.E.M Scholar ended their series with a bang, with many smiling faces from the crowd.